Millions of people around the world waited in anticipation for the birth of a Royal baby today. For William and Kate, and the Royal watchers, today is a significant day in history -as a Royal baby signifies a new beginning and a new family bond. In stark comparison, I too waited in anticipation today. I walked the streets of Canada’s darkest neighbourhood – the Downtown Eastside of Vancouver, in hopes that I could find Cindy, an HIV positive woman who struggles with mental illness and addiction. I crossed my fingers and hoped that today she would be ready to reach out and hear her child’s voice for the first time. I first met Cindy last week when we began ‘Beyond HELLO’, a school based project where we reach out to the homeless community with compassion and understanding, and listen to life stories.Our goal is to provide hope to the Downtown Eastside residents and treat them with the dignity and respect they deserve as we attempt to breakdown down the us-them mentality that seems to plague our society. To read part 1 and part 2 of our story , click on these links. Today our day began as a scavenger hunt. The streets were busier than usual and behaviours seemed more extreme than normal. Even the familiar faces that normally welcome us to the neighbourhood seemed a little less cheerful today. Probably a combination of the hot weather, the full moon and the monthly pay day – still two long days away. We walked the streets for an hour hoping to find Cindy. We decided to see if she was at home, and took the elevator up to her floor of the government funded building. The elevator itself seemed more like a crate, with nothing but stained metal sides and cracked buttons. Through the narrow halls we found her door, with a memo stuck to it, requesting her to bag her clothes so they could spray for bugs. We knocked and waited. No answer. Back on the streets we walked up and down the hot pavement. In casual conversation we spoke to some residents, often showing Cindy’s photo and asking if they had seen her. Most had. 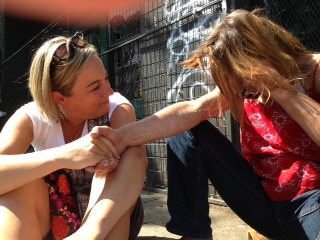 Cindy is well known in the DTES as she has survived the streets for over twenty years. Despite her temper and drastic mood swings, there is something very likeable about Cindy. She is intelligent, articulate, creative and passionate. Despite her traumatic life story she is a strong woman. When she opens up, and makes sincere eye contact, you can see her soul buried under layers and layers of hurt. She has had a tough life, and is her own worst enemy, yet underneath a woman exists with moral values and a big heart. As we spoke to others on the street, they each had something positive to say. One woman told us about her journey through detox with Cindy. Fortunately for this woman, she has managed to stay clean. She suggested we try InSite, the safe injection site. As we entered InSite, we were caught up in a steady stream of clients trying to enter the building through a narrow entrance ramp. Others leaving shuffled their way through the narrow path bumping into one another in the tight space. Some brought their bikes in with them as there is no security in leaving them unattended on East Hastings. The staff were busy checking clients in and out so we stepped aside to the waiting area until they had a moment. The staff at InSite are wonderful, nurturing and respectful, and spent time listening to us about our project. They could not release confidential information but they told us that they would be happy to help as messengers by passing on information to Cindy. We left a note with them including Cindy’s daughter’s phone number and then make our way back to the streets. In our last attempt before heading to the car, we saw Cindy, just steps away from InSite, standing in front of the community garden where she planted the lavender for her daughter just last Friday. Cindy looked alive and vibrant today. She was wearing jeans, a red tank top and a grey headband. She almost looked stylish – a drastic comparison to her outfits last week. David and I approached Cindy, again not knowing whether she would welcome our visit. This time she did. She started by saying she could not believe our timing as she was just thinking about us. I told her that I had more news about her daughter. I let her know that her daughter had shared more poetry and we have printed it for her. I also let her know that her own daughter has lived a life with some similar struggles. She too had a baby at 16, and she has also struggled with addiction. Cindy realized this means she is a grandma. I let her know her granddaugther’s name and tears of love poured down her face. Her legs became weak and she had to hold on to me for stability. The news was so powerful that she needed to sit. Beside her on the dirty streets she had an over stuffed brown teddybear. She used the bear as her pillow and sat down. Cindy stared deeply into my eyes not wanting to miss a single word as I told her about my emails back and forth with her daughter. I assured her that her daughter understands her, and let her know that her daughter would love to say hi. Cindy looked to me for strength and said ok. I called the number and listened to the rings at the other end. After three rings I began to worry that we would not make a connection. Then, I heard the voice of her daughter on the other end. I let her daughter know that Cindy was ready to say hello. Cindy took my phone and whispered “Hi baby – it’s your mom”. Tears fell and she reached out her hand and took my hand. She squeezed my hand tightly and I encouraged her to keep going, rubbing her back while she spoke. The first thing she asked her daughter was whether or not the adoption agency gave her the twelve page letter she had left explaining all the reasons she had to give her up. They had not. Like a woman on a mission, Cindy condensed the 12 pages into a three minute explanation about her teenage years, her abusive boyfriend, her lack of support and her most difficult decision. Her daughter understood. The conversation became a bit lighter and the two of them discussed pottery and poetry. Both women have an artistic, creative spirit, and felt the connection with one another. Cindy then listened as her daughter spoke. While I did not hear what her daughter said, I know it was heartfelt as Cindy’s emotion was one I cannot even describe. All I can say, is that her face was overcome with expressions I have only witnessed through media after a tragedy has occurred. With a mix of love, anguish and grief, her mouth seemed to stretch back, and her eyes focussed intently as tears poured from her face. It was the most raw emotion I have ever experienced. I cannot find the words to describe it well but know I will never forget the image. Soon, overcome by her emotion, Cindy tilted her head back and let the phone fall gently from her hand to the sidewalk. I picked up the phone to see how her daughter was doing. I asked Cindy if she had anything else to say. Through grief she asked me to tell her she loved her. I told her she had the courage to say it herself and held the phone to her ear while she whispered to her daughter that she loves her. She explained that she has full blown AIDS and does not have long to live. It was a conversation Cindy has dreamed about for over twenty years, yet finding family when life is limited seems so unfair. With a mix of shame and hope, love and pain, Cindy handed the phone back to me and let her head fall gently back on the sidewalk against the teddy bear. I let her daughter know I would be in touch soon and we hung up. We sat with Cindy as she cried, staining her daughter’s poetry in fresh tears. For the first time in Cindy’s life she has heard her baby speak. She heard forgiveness for her most difficult decisions. She heard acceptance despite her lifestyle. Through loving words, a mother daughter connection was made, helping both of their souls heal. Their missing puzzle piece is now found. For Cindy it is bitter sweet. She has waited her whole life to feel the unconditional love that exists between a parent and a child and has now found it near the end of her life. Together we sat hand in hand on the hard, stained pavement surrounded by graffiti and the smell of drugs. Together, despite our surroundings, we found hope in Vancouver’s darkest neighbourhood. All because these women had the courage to go ‘Beyond HELLO’. This entry was posted in Addiction, Community, homelessness, Reflection. Bookmark the permalink. What an incredible start to Beyond Hello Kristi! You are amazing! I am typing through tears after reading your post. well done you never gave up and made a difference. that’s who you are! love you. Simply amazing. I am sharing your blog on my Facebook, you have a lot of TF supporters out there. Thanks kiddo. Love the fox crew! Wow – so touching…Thank you for sharing this story. Would love to connect and talk about how Project HELLO and the Lookout Society could work together. Sounds great. I will give you a call tomorrow. When is the book coming out? What a fantastic story Kristi, I too had tears in my eyes. 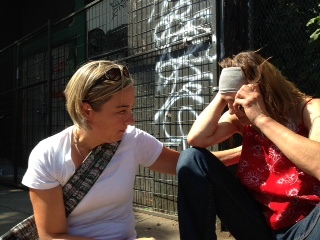 The downtown Eastside is a very rough place, keep safe. The final part to Kristi Blakeway’s Beyond HELLO.